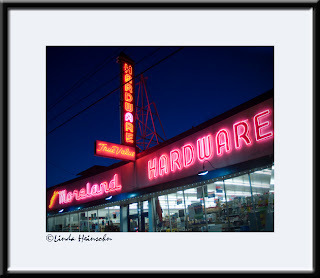 Driving home from the auto show, I was able to capture the sign of the GREAT hardware store in our neighborhood. The best place to take this photo is in the middle of the street, so shooting from my car is really the best option. Thanks to "rush hour traffic" on Milwaukee Ave, I had plenty of time to turn on my camera and compose as best I could while driving slow. The photo still needed a little distortion correction in PS.